Studying the interactions between people and places and the spatial organisation of human activity, with the three previous concepts and politics allows us to study politics geographically. 1. Throughout time, states and countries have always competed for territory and/or resources. The 'War on Terror' being an example of this, producing alliances between states and the deployment of troops in Afghanistan and Irag. 2. Geopoltics is a way of 'seeing' the world', some geopolitical theoreticians believe that the study of geopolitics makes the world a transparent space, that is 'seeable' and 'knowledgeable'. 3. The identification of 'situated knowledge' that is, geopolitics is not simply about country versus country. Apart from war, geopolitics can also include: racial conflicts in cities, restrictions on the movement of women and the diplomacy over greenhouse gas emissions. 4. Critical geopolitics, identifying the power relationships within geopolitical statements. Critical geopolitics aims to encourage anti-geopolitics. These are some key-words that may help you when reading through geopolitical literature (most taken from Flint, 2012). - maintaining and nurturing allies. - Countering current enemies and emerging threats. - How to justify to the global community and public, the 4 calculations above. Meta-geography: Spatial structures through which people order their knowledge of the world (Flint, 2012, Beaverstock et al 2006). State: 50 seperate entities that comprise a country, although in geopolitics, countries are called states. This model is historically based, founded upon his interest for naval history. In this model, power is based around the ability of 'global reach', to influence countries across the world. Modelski represents the worlds most powerful country as a 'leader', implying that it has willing followers instead of being dominant or forceful. A world leader is one that offers the world an innovation, such as institutions and ideas that provide geopolitical order and security. 1. 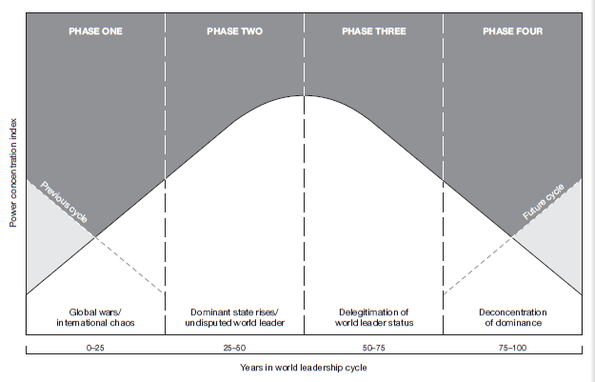 Phases of global war: the ability or right to be world leader is decided through a period of global war. 2. Phase of world power: Once victory has been achieved the geopolitical project of the world leader is renacted. 3. Phase of deligitimation: The imposed 'order' is welcomed, although over time dissent grows. 4. Phase of deconcentration: The challenges beginning in the previous phase become stronger, the leader uses its own materials and capacity to overall make it vulnerable to attack. This model has been used to look at several situations. Looking at World War II and the Cold War, several comparisons can be made to Modelski's model. Another model similar to Modelskis is Wallersteins world system theory (1979/1984).